Every human has a natural body shape. This is partly influenced by genetics and partly by nutrition or diet, fitness and lifestyle in the first few years of life. The natural body shape undergoes a change as an infant grows into a toddler and then into a teenager and subsequently a young adult. The final transformation of the natural body shape is complete post adolescence and whatever happens next is an outcome of lifestyle, fitness or the lack of it, health and diet, till old age when the body starts to lose mass, fat and many other quintessential components that make the physical form of life. There is one system of classifying human body shape. According to this system, there are three somatotypes or types of body shape. These are ectomorph, endomorph and mesomorph. Ectomorphs are humans with narrower frames. They have thinner bones, flatter butts and chests, smaller joints and they usually look skinny or slim but they actually have more body fat than visibly obvious. Ballerinas, models and distance runners are good example of ectomorphs. Endomorphs are bulkier than ectomorphs as they have more muscle and body fat. They tend to have shorter limbs and smaller shoulders. Their bone structure is larger. Curvy women, shot-put throwers or the linemen in football are good examples of endomorphs. Such people gain weight quickly, including muscle, which is unlike ectomorphs. Mesomorphs are athletic. They have wide shoulders and narrower waists. They look strong and have less body fat. Soccer players and sprinters are good examples of mesomorphs. These people tend to be stronger than others. They can gain and lose weight easily. They are more suited for bodybuilding. Men and women obviously do not fall neatly into the three somatotypes. There are many types of shapes. You must have heard of pear shape which is also referred to as bell, spoon or triangle, apple shape, banana shape aka straight or rectangular, hourglass or full hourglass and variations such as top hourglass and neat hourglass. All these types of body shape are a result of genes, hormones and lifestyle. The latter includes diet, fitness or activity and health. These shapes are so called or named because of the form assumed by the bust, waist and hip. Waist hip ratio is often cited as the most important contributor to body shape. This is wrong. It is the proposition of bust, waist and hip that determines the visible body shape. Apple shape, more commonly known as beer belly, is a sign of excess fat in the belly and abdominal region. There is excessive fat around the stomach and other internal organs, including heart, liver and kidneys. There is excess fat under the skin too. This shape means you are more likely to suffer from cardiovascular problems including heart disease. There is a higher risk of type 2 diabetes and certain types of cancer. You are also likely to have high cholesterol. 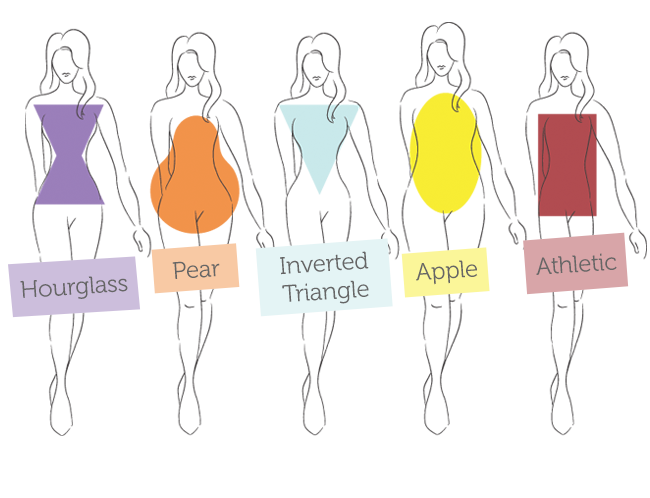 Apple, triangle or beer belly shape is more common in men than women. Apple shaped men or women are also vulnerable to chronic high blood pressure. Women are more likely to have what is called pear shape. You may refer to it as a spoon, bell or triangle. Pear shape is actually a combination of ectomorph and endomorph somatotypes, upper body of the former and lower body of the latter. A pear shaped body implies that there is excessive fat in the thighs, hips and buttocks. The stomach or belly region is relatively slimmer. The upper abdominal region may also have much less fat compared to the heavy bottom. This is not necessarily as bad as the apple shape. Although the excessive fat makes weight loss difficult, the only health condition that one must truly be conscious of is osteoporosis. Pear shaped women live much longer than apple shaped men, or women for that matter. Hourglass is deemed as the ideal figure for women. Banana or straight is also good as it is because of higher metabolism. Women or men who have a straight body shape do not gain weight easily and that is always a good thing. A distinction should be made between visible fat or bulkiness and body fat. A distinction should also be made between bulk that is made of broader bones or more muscles and just fat. Next How to Prevent the Common Diseases of White Collar Workers?